English painter,printmaker, pictorial satirist, social critic, and editorial cartoonist William Hogarth was born 10 November 1697. He has been credited with pioneering western sequential art. His work ranged from realistic portraiture to comic strip-like series of pictures called “modern moral subjects”. Knowledge of his work is so pervasive that satirical political illustrations in this style are often referred to as “Hogarthian”. He first worked as an engraver in 1720, engraving coats of arms, shop bills, and designing plates for booksellers. ThenIn 1727, he was hired by Joshua Morris, a tapestry worker, to prepare a design for the Element of Earth. In 1757 he was appointed Serjeant Painter to the King. Early satirical works included an Emblematical Print on the South Sea Scheme, about the disastrous stock market crash known as the South Sea Bubble, in which many English people lost a great deal of money. This features Protestant, Catholic, and Jewish figures gambling, while in the middle there is a huge machine, like a merry-go-round, which people are boarding. At the top is a goat, written below which is “Who’l Ride”. Other early works include The Lottery ; The Mystery of Masonry brought to Light by the Gormogons ; A Just View of the British Stage ; some book illustrations; and the small print, Masquerades and Operas. He continued this theme in 1727, with the Large Masquerade Ticket. In 1726 Hogarth prepared twelve large engravings for Samuel Butler’s Hudibras including The Assembly at Wanstead House. he then turned his attention to the production of small “conversation pieces” . Among his paintings were The Fountaine Family (c.1730), The Assembly at Wanstead House, The House of Commons examining Bambridge, and several pictures of The Beggar’s Opera. Hogarth’s depiction of John Dryden’s The Indian Emperor, or The Conquest of Mexico at the home of John Conduitt, master of the mint, in St George’s Street, Hanover Square, A Midnight Modern Conversation, Southwark Fair , The Sleeping Congregation Before andAfter, Scholars at a Lecture’ The Company of Undertakers (Consultation of Quacks), The Distrest Poet (1, The Four Times of the Day, and Strolling Actresses Dressing in a Barn are also Masterpeices. 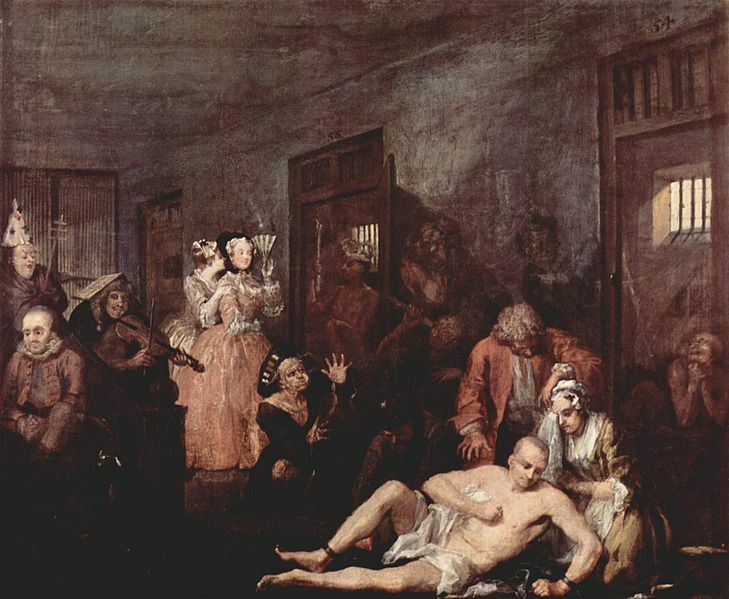 In 1731, Hogarth completed the earliest of the series of moral works A Harlot’s Progress, which features six scenes, featuring the miserable downfall of a country girl who began a prostitution career in town is traced out remorselessly from its starting point, the meeting of a bawd, to its shameful and degraded end, the whore’s death of venereal disease and the following merciless funeral ceremony. This was followed in 1735 by the sequel A Rake’s Progress which portrays the reckless life of Tom Rakewell, the son of a rich merchant, who starts off promisingly, but wastes all his money on luxurious living, whoring, and gambling, and ultimately finishes his life in Bedlam. In 1743–1745, Hogarth painted the six pictures of Marriage à-la-mode, a moralistic satire of upper-class 18th-century society which shows the miserable tragedy of an ill-considered marriage for money rather than love. They are set in a Classical interior, and show the story of the fashionable marriage of the son of bankrupt Earl Squanderfield to the daughter of a wealthy but miserly city merchant, starting with the signing of a marriage contract at the Earl’s mansion and ending with the murder of the son by his wife’s lover and the suicide of the daughter after her lover is hanged at Tyburn for murdering her husband. In the twelve prints of Industry and Idleness (1747) Hogarth shows the progression in the lives of two apprentices, one of whom is dedicated and hard working, the other idle. This shows that those who work hard such as the industrious apprentice get rewarded, and he becomes Sheriff, Alderman, and finally the Lord Mayor of London. Whilst idle apprentice, begins with being “at play in the churchyard”, holes up “in a Garrett with a Common Prostitute” after turning highwayman) and is eventually “executed at Tyburn” after being sent to the gallows by the industrious apprentice himself. Later important prints include his pictorial warning of the unpleasant consequences of alcoholism in Beer Street and Gin Lane, which shows a happy city drinking the ‘good’ beverage of English beer, versus Gin Lane which showed the effects of drinking gin which, as a harder liquor, caused more problems for society. People are shown as healthy, happy and prosperous in Beer Street, while in Gin Lane they are scrawny, lazy and careless. The prints were published in support of what would become theGin Act 1751. Lately I have been listening to The Endless River, the hotly anticipated fifteenth studio album by British progressive rock band Pink Floyd. It is Pink Floyd’s first studio album since the death of keyboardist and founding member Richard Wright, who appears posthumously, and the third by the David Gilmour-led Pink Floyd after Roger Waters’ departure in 1985. It is partly a tribute to keyboard player Richard Wright, who died of cancer in 2008. It also features him heavily – he was back on board for 1994’s The Division Bell, and it’s from the sessions for that album that the material for this one has been taken. Described as a “swan song” for Wright, The Endless River mostly comprises instrumental and ambient music and uses the creative principles Used on Pink Floyd classics like Echoes, Shine On You Crazy Diamond and Animals. As well as The Endless River being Rick Wright’s swansong, Nick Mason and David Gilmour have also said that it will be Pink Floyd’s last. It is based on 20 hours of unreleased material David Gilmour, Nick Mason and Richard Wright wrote, recorded and produced during sessions for Pink Floyd’s previous studio album The Division Bell (1994) at the Britannia Row Studios in Islington, With the intention of releasing it on a separate instrumental album. However This did not come to fruition and it was not used, until 2014, when David Gilmour and Nick Mason re-entered the studio and, starting tinkering with unreleased keyboard performances by Richard Wright, who sadly died in 2008, adding further instrumentation to the tracks, as well as creating new material. The result is The Endless River, including 60% of recordings other than the 1993 sessions, but based upon them. The title is a further link, ‘… the endless river…’ being part of the closing phrases of High Hopes, the final song of the previous Pink Floyd album. Stylistically, The Endless River includes all of the musical elements that characterize Pink Floyd: mellifluous keyboards, jazz-tinged drums, musique concrete, ethereal vocals, and distinctive, emotional lead guitar. As well as Pink Floyd’s trademark backing vocals, there is one vocal track, with lyrics by author Polly Samson, who also contributed to The Division Bell.”. The album was produced by Gilmour, Youth, Andy Jackson and Phil Manzanera. The cover concept is by Ahmed Emad Eldin with sleeve design by Stylorouge. Aubrey Powell served as creative director for the artwork. He formed another solo band, simply titled ASHBA after his departure from Beautiful Creatures where he added former Tuff guitarist Michael Thomas, who was Ashba’s replacement in BC but left the group in 2003, bassist John Younger and drummer Blas Eliasrounded out the groups lineup.] Also in 2003, Ashba was invited to participate in the group Brides of Destruction with Nikki Sixxand Tracii Guns but turned it down to focus on his solo project. In 2005, a small controversy was caused when it was suggested that neither Tommy Lee nor Mick Mars played on the new tracks for Mötley Crüe’s compilation album Red, White & Crüe (duties were supposedly handled by Vandals’ drummer Josh Freese and Ashba as well as Mick being replaced by Ashba on their reunioAshba released the critically acclaimed album The Heroin Diaries Soundtrack after collaborating with Mötley Crüe bassist Nikki Sixxand producer James Michael under the name Sixx:A.M. in August, 2007 serving as a soundtrack to Sixx’s autobiography The Heroin Diaries: A Year in the Life of a Shattered Rock Star.The single Life is Beautiful reached #2 on the Billboard Hot Mainstream Rock Tracks. Originally the group stated they had no intention of touring. After constant support for the band and interest in a tour, they held a nationwide vote for tour dates. The tour was scheduled to start in spring 2008, but had been postponed to the summer due to unforeseeable circumstances On April 15, 2008, Sixx:A.M. announced they would be touring as part of Mötley Crüe’s Crüe Fest, along with Buckcherry, Papa Roach and Trapt. The tour began on July 1, 2008, in West Palm Beach, Florida. During Crüe Fest, Papa Roach drummer Tony Palermo served as a touring drummer for the band. A deluxe tour edition of The Heroin Diaries Soundtrack was released on November 25, 2008, which included a bonus live EP entitled Life Is Beautiful which features recorded performances from the band’s summer tour. In April 2009, both James Michael and Nikki Sixx confirmed that the band is currently in the studio, recording new material. Sixx added that the new material is “inspiring. it feels like we may have topped ourselves on this album coming up, and can’t wait for you to hear what it sounds like.” On May 3, 2011 the current Sixx:A.M. album “This Is Gonna Hurt” was released. In March 2009 Ashba was announced as the new lead guitarist of Guns N’ Roses replacing Robin Finck, who had left the band to rejoin Nine Inch Nails He first toured with the band as part of the Chinese Democracy Tour where on December 11, 2009 Guns N’ Roses played in Taiwan.He is currently on tour with the band as part of its 2013 Australian Tour”. In 2003 Ashba founded Ashba Media, Inc. AMI designs the look and feel of every Virgin Megastore. They also have other clients, such as Ovation guitars, Royal Undergroundand many more. Daren owns two corporations, Ashba Media, Inc. which handles the art side of things and Ashbaland, Inc. which handles the music side of things.Ashba contributed to Mötley Crüe’s 2008 album Saints of Los Angeles penning all tracks with the exception of This Ain’t a Love Song The title track Saints of Los Angeles was nominated for a Grammy the same year.